What is that old saying, even a stopped clock is right twice a day? Well, you can apply the same logic to Nicolas Cage movies. The sheer volume of dross that the man puts out, you can easily relegate him to B movies, but every so often a vehicle comes along that makes you think, wow that wasn’t half bad. National Treasure, from Disney, is one such vehicle. Bringing together all the conspiracy theories regarding the history of the USA into one movie, weaved around a Raiders Of the Lost Ark story you have a highly paced family thriller, with plenty of action and humor. 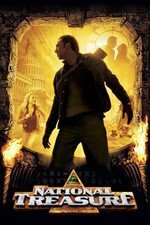 The plot involves Ben Gates (Cage) and his side kick Riley (Justin Bartha), following a series of clues to uncover the Templar Treasure. This was all being bank rolled by Ian Howe (Sean Bean), who becomes a little impatient and then basically becomes the bad guy of the story. Not to give away a huge plot line, but this is one of the few movies where Sean Bean actually survives, even though he is the villain. Declaration of Independence as if it was a product placement. You would think in a real life situation, they would simply refer to it ‘as that document’. 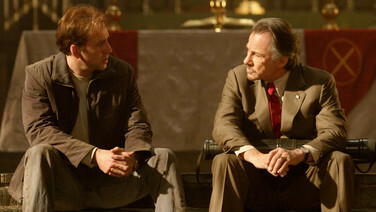 Jon Voight, and Harvey Keitel as the FBI agent who is hunting him down. What makes this movie so watchable is the very catchy soundtrack that accompanies each scene. Very orchestral and dare I say John Williams feel, though not quite to his standard. Disney definitely milked this series for a few more sequels, but none managed to get anywhere near the slickness of this first outing. This movie definitely helped Nicholas Cage with his credibility, as the lead role could have easily been played by another without too much effort. A good clean family movie that can be enjoyed without worrying about upsetting the morality or offending any of their young minds. Just remind them, that not all Cage movies are this good – don’t fill their wee heads with foolish notions.